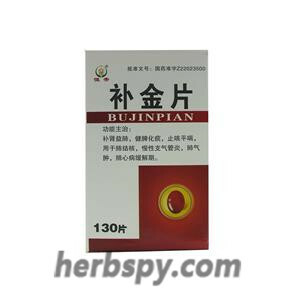 For tuberculosis, chronic bronchitis, emphysema, pulmonary heart disease remission period. Nourishing kidney and lung,invigorating spleen to remove phlegm,relieving cough and asthma. Dried Tangerine Peel,Haming Oil,Deerhorn Glue,Black-tail Snake,Human Placenta,Egg yolk oil,Platycodon Root,Tortoise-shell Glue,Stemona Root,Tthunberg Fritillary Bulb,Red Ginseng,Common bletilla,Solomonseal Rhizome,Indian Bread,Tokay Gecko (Removed head and feet),Dwarf Lilyturf Tuber,English Walnut Seed,Chinese Angelica Root. This product is sugar-coated tablets, after removal the sugar-coated tablets showed brown to dark brown; slightly bitter taste. For oral use after meals,5-6 tablets twice daily or by medical ordor. Avoid hot and spicy food during taking this product. Stage Food and Drug Administration Approval number:Z22023500.